Home » Archive by category ROOF REPAIRS"
Before you make any decision about your roof or gutters, it would be useful to consider your home insurance policy. Although there are many differences across providers and polices, we have found that there are common trends in the outcomes of claims when it comes to your roof and gutters (and any damages that may have subsequently resulted). You should always refer to your product disclosure statement or insurance provider directly to discuss your specific circumstances and what your policy covers. Typically, most insurance providers WILL provide coverage if damage has been caused to your roof or gutters due to storm, fire, burglary or vandalism or some sort of accident like a truck reversing into your roof and/or gutters. It is common practice however, to only repair the “affected area.” If the wind blows your ridge capping or roof tiles off, your insurance provider will most likely only cover those that were actually damaged. Working as a tradie for a number of insurance claims assessors we do find a common misconception is when it comes to storm damage. Just because your roof or gutters leak during a storm does not necessarily mean that you will be covered. The question at hand is: did the storm actually create the roof and/or gutter issue? OR was the issue already there and you only noticed the problem when the storm hit? Overtime your roof will begin to deteriorate. Generally, speaking roofs will require maintenance after 15-20 years. We are also unfortunately, finding newer homes that are less than 10 years old that require roof maintenance. This is common for homes that have originally been completed in a hurry by underpaid contract roofers. If your roof or gutters have deteriorated and then subsequently leak during a storm, you probably WILL NOT be covered for the roof or gutter repairs. 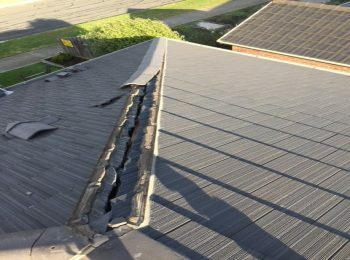 Deterioration can include: rusted valleys or roof sheets, broken seals on roof penetrations, cracking of mortar along ridge capping tiles, tiles becoming porous, leaves and debris blocking water flow or cracked/sagging flashings. The reason this is not covered is because the storm itself did not create the issue and instead it has been caused gradually overtime. Insurance providers place the responsibility of home maintenance with the owner. This includes your roof and gutters. If it is found that the cause of your roof leak is due to previous faulty workmanship such as dodgy repairs or installation and/or design problems, generally you WILL NOT be covered. This is why it is of the utmost importance to make sure you engage a suitably qualified professional for any roofing or guttering project. roof probably WILL NOT be covered. Issues we find with roofing and guttering compliance include the materials used for low-pitched roofs i.e. corrugated metal roofs with a pitch of less than 5 degrees, the spacing of downpipes (or lack of), the incorrect fall of box gutters and the installation and spacing of roof tiles. These issues may only present during extreme heavy rainfall, however will need to be fixed to avoid problems in the future in similar weather conditions. You can contact Summit Roofing Services directly for an independent roof report or your insurance provider directly. Summit Roofing Services are also able to assist you with your maintenance if you have already obtained a report from your insurance provider and need to undertake private repairs. Simply email your roof report/assessment to: info@summitroofingservices.com.au for a cost estimate and general advice. We are also more than happy to provide inspections and reports to customers who are looking for a second opinion or alternative repair options.